With Christmas approaching, people are putting together their lists for Santa Claus. I’m not sure I’ll find any of these things under my tree, but here’s what I want. Get rid of the Department of Housing and Urban Development. Shut down the Department of Agriculture. Eliminate the Department of Transportation. Pull the plug on the Department of Energy. In the joyous spirit of the season, now let’s add to this collection by targeting the Department of Veterans Affairs. The is the agency that put veterans on secret waiting lists, leading to needless and tragic deaths. And then the bureaucrats awarded themselves big bonuses (nice work if you can get it!). And the shoddy treatment of America’s former warriors continues. Here are some excerpts from a story in the Daily Caller. …almost 600 veterans who received dental care may have been infected with HIV or hepatitis. …the VA is notifying 592 veterans who had dental procedures from a particular dental provider… If any veterans test positive for HIV or hepatitis, they can receive free treatment. Gee, that’s a great deal. You may get a life-altering illness, but the bureaucracy that enabled the illness will give you additional treatments. Oh, and you’ll be glad to know that the VA dentist who potentially exposed the veterans is continuing to draw a government paycheck. Instead of being fired, that dentist has been reassigned to an administrative role, despite potentially exposing almost 600 veterans to HIV or hepatitis. Like I said, nice work if you can get it. The VA’s penchant for secrecy wasn’t limited to waiting lists. The bureaucracy also has tried to cover up poor performance at dozens of local medical facilities. Stars and Stripes has revealed the unseemly details. A veterans group has blasted the Department of Veterans Affairs over leaked internal documents showing dozens of medical facilities performing at below-average levels. USA Today obtained the documents and published them Wednesday, revealing the secret system. The VA had previously refused to make the ratings public, claiming the system is for internal use only. It rates each of the VA’s medical centers on a scale of one to five, with one being the worst. …The worst performing centers are in Dallas and El Paso, Texas, and in Nashville, Memphis and Murfreesboro, Tenn. The documents also show that some medical centers have not improved despite scandals and scrutiny from Congress. The Phoenix VA still sits at a one-star rating despite a 2014 scandal revealing veterans died while waiting for care and that staff manipulated wait-time data there and at other VA hospitals across the country. You’ll be happy to learn, however, that there were some consequences for the Phoenix division. In response the malfeasance, neglect, and mistreatment of veterans, the leaders of the VA in Washington decided to punish the local bureaucracy by…well, take a wild guess. The VA announced last October it plans to allocate $28 million to the Phoenix center in addition to its annual budget. While these scandals are maddening, they are a distraction from the bigger problem. Simply stated, the core structure of the VA is misguided and the entire bureaucracy should be shut down. Two of my colleagues, Michael Cannon and Chris Preble, explained the problem in a column for the New York Times. Even when the department works exactly as intended, it helps inflict great harm on veterans, active-duty military personnel and civilians. Here’s how. Veterans’ health and disability benefits are some of the largest costs involved in any military conflict, but they are delayed costs, typically reaching their peak 40 or 50 years after the conflict ends. …when Congress debates whether to authorize and fund military action, it can act as if those costs don’t exist. But concealing those costs makes military conflicts appear less burdensome and therefore increases their likelihood. It’s as if Congress deliberately structured veterans’ benefits to make it easier to start wars. …The scandal isn’t at the Department of Veterans Affairs. The scandal is the Department of Veterans Affairs. They proposed an idea which would lead to honest budgeting and make the Department of Veterans Affairs superfluous. We propose a system of veterans’ benefits that would be funded by Congress in advance. It would allow veterans to purchase life, disability and health insurance from private insurers. Those policies would cover losses related to their term of service, and would pay benefits when they left active duty through the remainder of their lives. To cover the cost, military personnel would receive additional pay sufficient to purchase a statutorily defined package of benefits at actuarially fair rates. …Insurers and providers would be more responsive because veterans could fire them — something they cannot do to the Department of Veterans Affairs. Veterans’ insurance premiums would also reveal, and enable recruits and active-duty personnel to compare, the risks posed by various military jobs and career paths. Most important, under this system, when a military conflict increases the risk to life and limb, insurers would adjust veterans’ insurance premiums upward, and Congress would have to increase military pay immediately to enable military personnel to cover those added costs. Jonah Goldberg of National Review takes a different approach, but reaches the same conclusion. He starts by pointing out more bad behavior by the VA. There is only one guaranteed way to get fired from the Department of Veterans’ Affairs. Falsifying records won’t do it. Prescribing obsolete drugs won’t do it. Cutting all manner of corners on health and safety is, at worst, going to get you a reprimand. No, the only sure-fire way to get canned at the VA is to report any of these matters to authorities who might do something about it. …“Our concern is really about the pattern that we’re seeing, where whistleblowers who disclose wrongdoing are facing trumped-up punishment, but the employees who put veterans’ health at risk are going unpunished,” Special Counsel Carolyn Lerner recently told National Public Radio. And he then says the only real solution is to eliminate the bureaucracy. The real fix is to get rid of the VA entirely. The United States has an absolute obligation to do right by veterans. It does not have an absolute obligation to run a lousy, wasteful, unaccountable, corrupt, and inefficient bureaucracy out of Washington. …Imagine that the federal government simply gave all of the VA hospitals to the states they’re in. Instead of the VA budget, Congress just cut checks to states to spend on their veterans. You’d still have problems, of course. But what you would also have are local elected officials — city councilmen, state legislators, mayors, governors, etc. — whom voters could hold directly accountable. …this process would allow everyone to learn from both mistakes and successes in a way that a centralized bureaucracy cannot or will not. Personally, I’d rather see the money spent on veterans go straight to the veterans themselves, in the form of cash payments or vouchers to be used for health care in the private sector. National defense is a legitimate function of the federal government, so that means fairly compensating the people who give service to the country. Especially if they suffer wounds that require short-run or long-run care. But as both my colleagues and Jonah Goldberg have explained, none of that means we need a cumbersome and blundering (and sometimes venal) bureaucracy. Donald Trump shouldn’t be figuring out who to pick to head the VA, he should be putting together a plan to get rid of it. 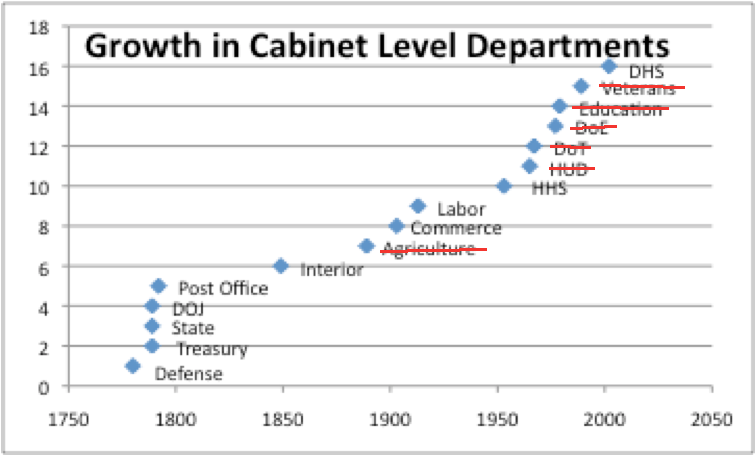 To conclude, I found a nice chart that shows when various departments were created, which I have helpfully augmented by crossing out the ones that I’ve explained should be abolished. As you can see, there is still some low-hanging fruit to go after. By the way, the White House website says the Small Business Administration has “the status of Cabinet-rank,” whatever that means. I guess it’s sort of like a participation trophy for the SBA. In any event, I’ve also explained why that useless bureaucracy should be wiped out. And I guess it’s good news that the Postal Service is no longer part of the cabinet, though that’s secondary to the more important issue of getting the government out of the business of delivering mail. P.S. The VA also is capable of wasting money in ways that don’t involve premature deaths for veterans, so it’s a full-service bureaucracy! Agreed. Defund the VA. Medical can be covered by a Medicaid-Veterans arrangement using local doctors. Compensation can be determined by servicing branch with award of disability retirement. The rest is unneeded, VA home loans, GI bill, etc. The VA is corrupt and employees that expose it are fired. If you are for getting rid of the Va. Then how about cutting politicians wages and once you leave office your check stops. PTSD, strange life we live within America. Damned when you do and Damned when you do. Sorry, but some of us are not even considered American Patriots. Nothing, is right in this country. combat veteran guess I have to die for self. Come visit me? Not, going to boust on who I am just get to meet me? Miami, FL. Did I just read that men and women should sign up for military service, risk their lives for their country, and then be forced to bid on health care? Use your paycheck to buy health insurance for the job you risk your life doing and no one else really wants to do. Andrew Carneigie became the equivalent of a billionaire like Gates. 40% of his steel mill workers incurred permanent injury, 11% of them were killed on the job out right. NO COMPENSATION FOR THEIR FAMILIES, WIVES, ORPHANS. Is that the business model you propose to defend America? It sort of sounds like it. American physicians are paid double what other similarly skilled physicians are paid across the world. That is not the case at the VA. Who will treat us poor veterans with no money if not the VA? Do you believe these physicians making double what they can anywhere on the planet are going to treat us for free? Do we go back to the 1960’s when Congress said we’re not going to fund you? Who pays the freight for our service connected injuries we live with the rest of our lives? Do we have to talk generous doctors into treating us for free? Will Big Pharm fill our prescriptions for nothing? I really don’t get it. We could abolish the entire government. Then what? Is there an end game here? We abolish the VA and then we…..? on December 21, 2016 at 7:22 pm Mr. Dyke Stewart Andrews. This is the most ridiculous thing ive ever read. yes, lets just abolish something that takes care of millions of veterans, not make it better. As a vet, im offended, and frankly more pissed off at this than anything ive read this whole year. I officially hate you more than any other human being on this planet. What a crock of crap dreamed up by some idiot(s) without researching all the good that the VA employees do for Veterans. Figure out how to deal with the half baked politicians and the morons that make the decisions in the VA and you can solve the problems. The same old BS of throwing money at a problem has never solved anything but that’s been the governments mantra for far too long. Jail some of the worthless pieces of crap working in the VA and let Veterans take care of Veterans and Veterans will be cared for. I have nothing but praise fro the Spokane, WA VA Hospital, but you wouldn’t know anything about that. As one who works at the VA, we work our tail off for the Vets. Put some positives out there about the VA, as there are many. Take the time to research the positives and what we do right. If you are a service connected or combat wounded veteran you also receive financial compensation on a monthly basis. Would you also propose eliminating that as part of your VA health care?? Most VA rated veterans don’t understand or take for granted this financial part of thier VA health care. The cutting back or complete elimination of VA financial compensation would be first step in elimination of our VA. Think about how most of the veterans who complain about VA health care would respond to our government saying to them” no more monthly checks”. Wake up people….veterans need the VA…they need it managed and funded correctly, not eliminated.